Electronic health records are being implemented in many hospitals across Canada, yet there is a small group of nurses who would rather quit or retire than be working in their unit prior to implementation of electronic health records. This qualitative research study used extreme case sampling to reveal the thoughts, opinions and needs of these nurses. The ten themes that arose were: resource needs, change and transition, documentation, technology, nursing roles, diminished caring, computer literacy, positive comments, generations and negative comments. When these themes were triangulated with the opinions of the participants’ formal and informal leaders, the analysis was confirmed as valid. The revealed themes and sub-themes will serve as excellent valid evidenced-based indicators for use in quantitative survey tools during future electronic health records research. Hospitals are moving from paper documentation towards Electronic Health Records (EHRs) with the goal to support continuing, efficient and quality integrated health care. Nurses have voiced their concerns about EHRs and the significant change in nursing that computerization has brought to the profession, but have they been heard? The goal of this research is to reveal the thoughts, opinions and needs of nurses who may be feeling that they wish to leave the nursing workforce early because of the movement towards EHR documentation. Understanding the thoughts and opinions and listening to the needs of nurses is essential for supporting all nurses during the transition to EHRs. Implementing an EHR system is a complex change management process fraught with risk and conflict that requires careful strategic planning (McLane 2005; Kaufman Roberts, Merrill, Lai & Bakken, 2006). There is consensus, if not consistent empirical evidence, that the adoption of EHR systems can improve patient care, reduce risks to patients due to error, and improve legibility, security and cohesion of health care records. Although it was thought that EHRs would save time, this has yet to be proven by research (Poissant, Pereira, Tamblyn & Kawasumi, 2005). A recent literature review concluded that some nurses are dissatisfied with the state of the electronic health records (Stevenson, Nilsson, Petersson& Johansson,2010). It is becoming clear that some nurses are having difficulty with computers and the implementation of EHRs (Lee, 2007). A few of these nurses confess, in essence, they would rather retire or leave their job than be working in their unit when EHRs are implemented. In 2009, the average age of Canadian nurses was 45.2 years with the top four age groups clustered at or above 40 years (Canadian Institute for Health Information, 2010). National projects are underway in Canada aimed specifically at recruiting and retaining nurses (Canadian Federation of Nurses Unions, 2012). It is important to listen to and understand issues that are critical to nurses to retain our existing nurses and recruit new ones. The Theory of Planned Behaviour, a psychological theory which links attitudes to behaviour, was used to frame the research study (Ajzen, 1991). This theory may be valuable to explain the phenomenon of intention for ‘behavioural avoidance’. In this case, nurses may seek to avoid working on their units during the implementation of EHRs. The avoidance may be in the form of early retirement, job change to an institution without EHR or leaving the nursing profession. Since this research is exploratory, qualitative methodology was sought. Qualitative research using a case study methodology was employed using extreme case sampling. Participants in Phase 1 of the study were Registered Nurses employed at the hospital where the study was being undertaken who agreed to statement “E” in our recruitment flyer. Statement E, representing the extreme case, was as follows: “I feel like I would rather retire or leave my job than be working in my unit when electronic health records are implemented.” Statements A though D represented more favourable opinions about EHRs. Thus, the authors felt that extreme case sampling would allow for efficient data collection revealing the most number of themes in the shortest possible time. There was no exclusion criteria provided the research participants met the criteria described above. A research ethics board approved recruitment flyer was circulated to all areas of the multi-site hospital in order to solicit potential participants. Follow-up with managers and educators in the hospital units was done to ensure the flyers were posted and to improve awareness of the study. The study was also posted to the nursing intranet and was presented to the hospital research committee. Eleven Registered Nurses (RNs) who worked in pediatric (N=6) and adult (N=5) nursing areas consented to be interviewed. All participants were between the ages of 35 and 65 and all had diplomas as their highest level of completed formal nursing education. Participant years of nursing experience ranged from: 5-9 years (N=1), 15-24 years (N=1), 25-34 years (N=5), and more than 34 years (N=4). Interviews were conducted away from the patient care area and lasted between 30 and 60 minutes. All interviews were semi-structured but allowed for further probing based on the answers provided (see Table 1). No incentives were offered to Phase 1 participants however parking fees were paid if they had been incurred. All Phase 1 interviews were completed over a 3 month time period. All eleven participants consented to be contacted one year from the date of their interview to determine if their opinion had in fact resulted in a change in employment. The Phase 2 interview process was developed to seek alternate opinions about why registered nurses might consider avoiding work in a unit where EHR is implemented. The research goal of Phase 2 was to increase the validity and credibility of the overall results through alternative data sources or triangulation (Halcomb, 2005). Potential Phase 2 participants were approached based on their role in a recent (within 6 months) involvement with local EHR implementation teams. Of the ten people approached, nine consented to participate. All nine were formal or informal leaders from wards, a critical care unit or clinical informatics teams. No Phase 2 participants were aware of the identities of the Phase 1 participants. Phase 2 participants agreed to share their thoughts about individuals who might feel like they would rather retire or leave their jobs rather than be working when EHRs are implemented. Nine semi-structured interviews (see Table 2) were completed over a five month time frame that began just as the Phase 1 interviews were being completed. All Phase 2 interviews were completed prior to thematic analysis of the Phase 1 interviews so as not to influence the Phase 2 interviews. All Phase 1 & 2 audio-tapes were transcribed verbatim and irreversibly anonymized for circulation to the research team. All transcriptions were double checked with the original audio-tapes by the research team, and later destroyed. After the first few interviews were transcribed and analyzed, a code book of developing major and minor themes was created. The code book went through five iterations as new themes emerged, themes were combined, split, or moved. The final version of the code book is presented in Table 3. All four authors independently coded three Phase 1 and one Phase 2 interviews and then reached consensus on the thematic coding of those interviews. Disagreements that occurred were discussed until consensus was achieved. Next, all remaining interviews were independently coded by two of the authors, who then met and reached consensus on the thematic coding. A third author was consulted if consensus could not be reached.The research team used manual data analysis with a colour coding system representing each of the major themes and an alphabetical system representing the subthemes. Codes per interview were collated by interview phase (see Table 4). When coding the Phase 1 and Phase 2 interviews, the researchers also took care to highlight quotes from the participants which were particularly clear and representative of the theme in question. 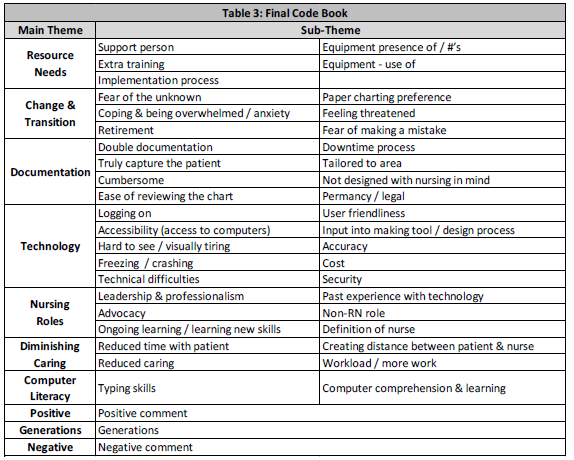 All Phase 1 and Phase 2 interviews underwent thematic analysis using the code book presented in Table 3. A discussion follows about each of the ten major thematic categories. The discussion begins with the theme which was spoken about most often, when analyzed collectively by all 20 participants (as seen in Table 4). 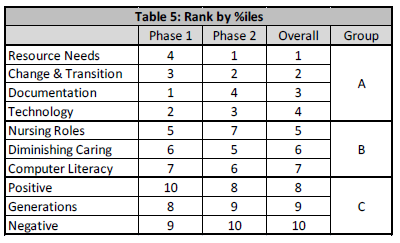 Differences in ranking between Phase 1 and Phase 2 participant’s responses have been highlighted. All participant quotes have been anonymized by replacing potentially identifying references to unit type or patient type with generic terms (e.g. “patient”); these are identified for the reader in square brackets. Lastly, to allow improved understanding of the discussion context, descriptive details, also in square brackets, were added for clarity. Of the ten major themes revealed, the formal and informal leaders in Phase 2 spoke most often about how EHR implementation would impact on the resource needs of their area. Although Phase 1 participants described their resource needs less often than Phase 2 participants, they spoke about a need for extra training, a need for support personnel, and the presence of and use of the equipment itself. All phase 1 participants were able to acknowledge their feelings about the change and transition that would occur in nursing, in their units and in themselves during the move to EHR documentation. The nurses discussed coping, anxiety & being overwhelmed, a fear of the unknown, a fear of making a mistake, and feelings of being threatened. They clearly stated their preference for remaining with paper charting and their preference for being retired or in an alternate setting prior to EHR implementation. Phase 2 participants commented on change & transition the second most often of all ten themes. They were clearly aware of the significant impact EHR implementation would have on the emotional and mental health of the nurses. Out of all the major themes revealed, Phase 1 nurses had the most comments about how EHR was going to impact on their documentation. Nurses worried that by using EHR they would be using a tool not designed for nurses, not designed for their nursing specialty area, or even one that was not able to truly capture the status of their patient. The Phase 1 nurses worried that the system would be cumbersome to use, would be difficult to review the chart for historical information, or that it would lead to double documentation. As well, they wondered about what would happen if the system was not functioning and whether or not the system was truly permanent (like their familiar paper system). They also had concerns about the legal ramifications of charting electronically. Phase two participants acknowledged these fears and were able to put themselves back in the nurses’ shoes occasionally sharing some similar concerns. Technological concerns were the second most talked about issue brought up by Phase 1 participants. They mentioned that the computers themselves were a barrier to care due to freezing and crashing, the long log in times, the accessibility of the computers both in numbers and placement, and the visual difficulties encountered when trying to view EHRs on screen. They also were worried that the system would not be user friendly or accurate, that the system was costly or that it had been designed without enough input from front line nurses. Phase 2 participants were aware of these concerns and perceptions and some shared these concerns as well. Phase 1 participants touched on a variety of matters related to their nursing role being impacted by EHR implementation. These included nursing advocacy, nursing leadership and professionalism, and the basic definition of a nurse. They also discussed how their nursing role was impacted by their ongoing learning, their past experience with technology and the influence of non-nursing roles. Phase two participants had less to say about nursing roles than Phase 1 nurses. This may be because they have already embraced EHR as part of the nursing role. The Phase 1 participants commented about how EHR would diminish their ability to care for the patient by reducing the time they could spend with their patient, creating distance between themselves and the patient and by increasing their workload. The Phase 2 participants, all leaders in their EHR implementation, were able to similarly acknowledge the nurses’ concerns for their ability to provide patient care with these new challenges. Both Phase 1 and Phase 2 participants shared concerns about nurses typing skills, computer literacy, computer comprehension and ability to learn about the computer environment. Both Phase 1 and Phase 2 participants were able to say positive things about EHRs. Not surprisingly, the Phase 1 participants, given their eligibility to participate in this study had the least number of positive comments out of all the ten themes. This is the first time in recent history that four different generations of nurses work together: the Veterans born between 1922 and 1943, Baby Boomers born between 1943 and 1960, Generation Xers born between 1960 and 1980 and the Nexters born between 1980 and 2000 (Clausing, Kurtz, Prendeville & Walt, 2003). These generations share some common values but they also exhibit differences stemming from the experiences of their eras. Veterans and Boomers remember a world without email or internet, cell phones, and when desk top computers and laptops were luxury items purchased by academics and businesses. The Xers and Nexters choose instant messaging and cell phone video or text messaging over email which they find outdated and too slow (Clausing et. al., 2003). Both Phase 1 and Phase 2 participants mentioned that the generational differences between people may have an impact on EHR implementation. Both Phase 1 and Phase 2 participants had generalized negative comments about EHRs. Not surprisingly, the Phase 2 participants, due to their leadership roles, had the least number of negative comments out of all the ten themes. In an effort to validate the results arising from the main study participants (Phase 1 participants), the themes and their resulting rank were compared between the two phases of the study. The thematic ranking by percentiles is shown in Table 5. The top four thematic categories, resource needs, change & transition, documentation, and technology, were consistent between both phases (Group A in Table 5). The fifth through seventh themes, nursing roles, diminished caring, and computer literacy, were also the same between phases (Group B in Table 5). Lastly, the final three themes, positive comments, generations, and negative comments, were also similar between phases (Group C in Table 5). The thematic clustering seen in groups A, B, and C adds validity and meaning to the coded themes for both the participants in Phase 1 and by the Phase 2 formal and informal leaders of study participants. It is interesting to note that the phase 1 participants had the most comments or concerns about documentation and technology. Since all Phase 1 participants documented patient care routinely and would be required to interact with EHR technology daily, it is not surprising that they commented on these concerns more often than Phase 2 participants who might not need to document in patient charts. Conversely, the Phase 2 participants had the most comments about resource needs, change and transition. Many Phase 2 participants were in a position that they had to plan for and fund resource needs as well as deal with larger change management issues in their formal or informal leadership roles. Therefore, the fact that Phase 2 participants commented on concerns about resource needs, change and transition more often than the Phase 1 participants was not unexpected. All the nurses who participated in Phase 1 interviews consented to be contacted one year after their initial interview to determine their employment status. Of the eleven Phase 1 participants, all nurses remained employed in their same units one year after the original interview. In that one year timeframe, six nurses units’ had implemented EHRs while the other five nurses worked in units that were approximately two months away from EHR implementation. While the nurses stated that they would rather not work in their units during the EHR implementation, there is no evidence to support that their opinions led to actual behavioural changes. The Theory of Planned Behaviour is a psychological theory which links attitudes to behaviour (Ajzen, 1991). Ajzen stated that an individual’s attitude, norms and perceived behavioural control formed an intention to behave in a certain way. The stronger the intention, the more likely the person was to perform the behaviour. The researchers hypothesized that the nurses may seek to avoid working in their units during the implementation of EHRs, but this was not observed in this study. These nurses may have had strong attitudes, norms and perceived behavioural control, but they may not have had sufficient actual behavioural control to implement their intentions. In fact, one participant, in speaking directly to the younger interviewer, implied that s/he did not have the financial control to retire even though s/he would have liked to do so. This may explain why, in follow-up, none of the nurses had actually left the profession or moved to another unit. The intended audience for the results of this research include: staff of private or public corporations or health care systems who are involved in the implementation of EHR’s, administrative staff seeking insight into early or unanticipated loss of nursing staff, nurses interested in giving voice to their experiences, and health professionals interested in the path these nurses have travelled. But what to make of it all? Reports about staff resistance to EHR implementation, previously explored retrospectively, presented methodological drawbacks such as poor recall and loss of key informants (Creswell, 2007). These issues created a critical gap in the literature given that staff resistance to EHR’s can severely impact EHR implementation plans, even leading to the closure of some EHR implementation projects (Scott, Rundall, Vogt, & Hsu, 2003). The current research study addressed this literature gap through qualitative research methods applied prior to EHR implementation. Understanding the thoughts and opinions and listening to the needs of nurses is essential to support nurses during major transitions such as EHR implementation. Uncovering the path these nurses have taken when agreeing with ‘the statement’ has allowed insight into potential barriers to successful EHR implementation. The findings presented above could be valuable in the planning stage of EHR implementation, facilitating the implementation teams’ awareness of areas of concern. Integrating the identified themes into quantitative measurement indicators for rapid quantitative research could help centers’ preparing for an EHR launch. This research with its qualitatively derived themes and sub themes would allow the creation of an evidenced based validated set of indicators. These indicators could be developed into a straightforward quantitative survey for use prior to EHR implementation. This would allow early identification of hot issues and areas of concern thus allowing for early intervention through education or improved communication strategies. Lastly, triangulation of the themes between nurses and formal or informal leaders raised an awareness of the overlap between the two groups. In this research, the analysis revealed that the formal or informal leaders had excellent insight into the concerns of these nurses. The reassuring message, that formal leaders are actually aware of nurses’ concerns, is key to communicating with front-line staff. Establishing an integrated EHR system is a national priority in both Canada and the USA with practical implications for individual nurses, nurse leaders, hospitals and nursing as a profession. Through qualitative research using extreme case sampling, ten major themes were uncovered which expressed the thoughts and opinions of nurses who agreed with a statement that they would rather retire or change jobs than work in their current position during EHR implementation. The themes were validated through triangulation with formal and informal leaders. The ten themes may become a conduit to uncover solutions applicable for improved EHR implementation plans and nurse retention, which may correspondingly result in improved healthcare for patients. We would like to acknowledge the assistance of these 4th year nursing students: Marie Reeves, Leena Ruparelia, Nancy Britnell, Heather Kewageshig, Lindsay Garlough, Stephanie Abu-Jazar, Bianca Salem & Daryl Geerts. Clausing, S. L. ,Kurtz, D. l., Prendeville, J., & Walt, J. L. (2003). Generational diversity – the Nexters. American Operating Room Nurses Journal, 78 (3), 373-379. Creswell, J. W. (2007). Qualitative inquiry & research design choosing among five approaches. (2nd ed.) Thousand Oaks, CA: Sage Publications. Halcomb, E.J. & Andrew, S. (2005). Triangulation as a method for contemporary nursing research. Nurse Researcher, 13 (2), 71-82. Kaufman, D., Roberts, W. D., Merrill, J., Lai, T., & Bakken, S. (2006). Applying an evaluation framework for health information system design, development, and implementation. Nursing Research, 55(2), S37-S42. Lee, T. T. (2007). Nurses’ experiences using a nursing information system: early stage of technology implementation. CIN: Computers, Informatics, Nursing, 25, 294-300. McLane, S. (2005). Designing an EMR planning process based on staff attitudes toward and opinions about computers in healthcare. CIN: Computers, Informatics, Nursing, 23, 85-92. Poissant, L., Pereira, J., Tamblyn, R. & Kawasumi, Y. (2005). The impact of electronic health records on time efficiency of physicians and nurses: A systematic review. Journal of the American Medical Informatics Association, 12, 505-516. Scott, J. T., Rundall, T. G., Vogt, T. M., & Hsu, J. (2003). Kaiser Permanente’s experience of implementing an electronic medical record: A qualitative study. British Medical Journal, 331, 1313-1316. Stevenson, J.E., Nilsson, G.C., Petersson, G.I. and Johansson, P.E. (2010) Nurses’ experience of using electronic patient records in everyday practice in acute/inpatient ward settings: A literature review. Health Informatics Journal, 16, 63-72. Canadian Institute for Health Information, Regulated Nurses: Canadian Trends, 2005 to 2009 (Ottawa, Ont. : CIHI, 2010). Bio: Wendy is a Clinical Informatics Specialist and prior to this was a Clinical Educator and bedside nurse in the NICU. Her interests include data for knowledge translation to achieve improved outcomes; technology as a tool to facilitate improvements; and the impact of electronic health records on nursing. Bio: Susan has worked in the NICU as a clinical nurse specialist, clinical educator, transport nurse and as a staff nurse. She is a faculty member at McMaster University School of Nursing. Her role includes research examining clinical nursing issues and practices and evaluating quality of care and patient safety issues. Bio: Barb has over thirty years experience in pediatrics and critical care and is currently the Pediatric Critical Care manager at McMaster Children’s Hospital and a Nursing Faculty member at McMaster University. She, along with the Pediatric Critical Care team, led the successful pilot of E-documentation for Hamilton Health Sciences. Bio: Rebecca holds a Master of Science from McMaster University (2011) and an Honours Bachelor of Science in Nursing from Brock University (2006). She is a bedside nurse in the Pediatric Critical Care Unit at McMaster Children’s Hospital and a Nursing Faculty member at Brock University.